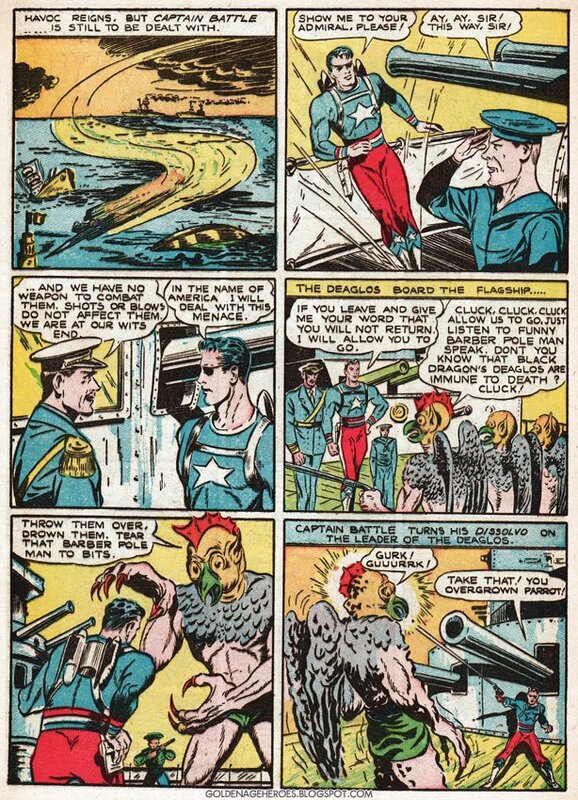 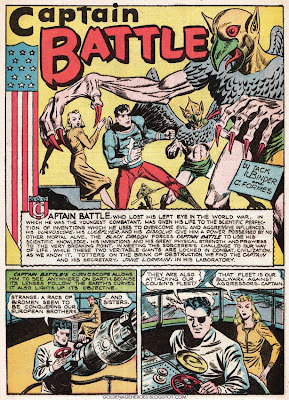 For some reason, as I was scanning this story, I thought Captain Battle had made a bigger impact while he was around. I mean, I'd heard of him, so surely he had been somewhat enduring. But it turns out he only appeared in 16 comics over a two-year period and that was it. 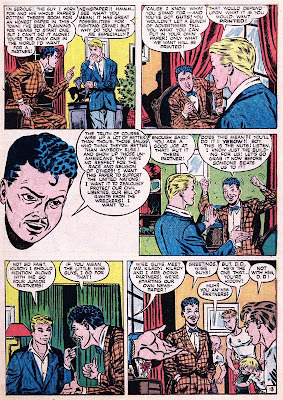 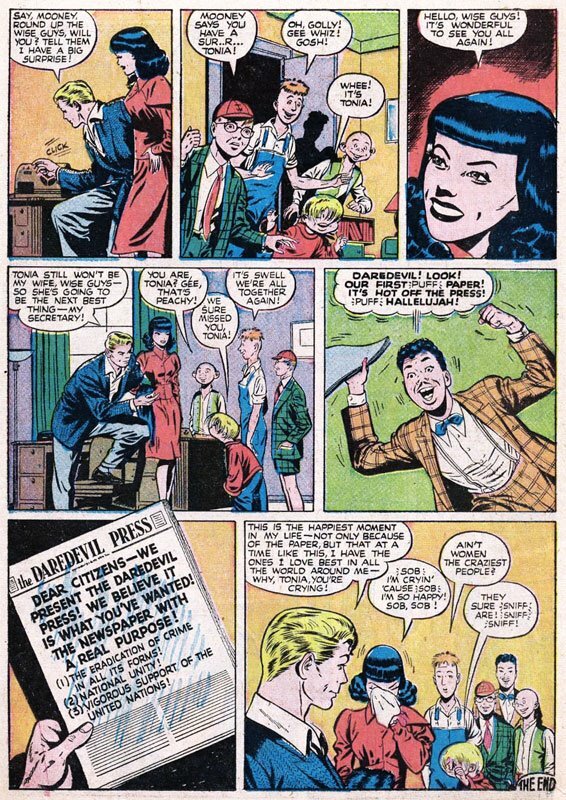 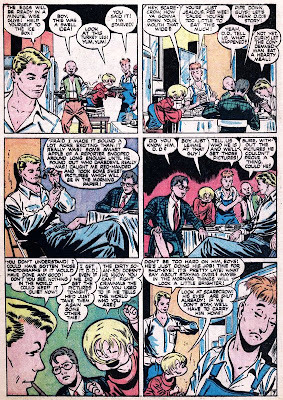 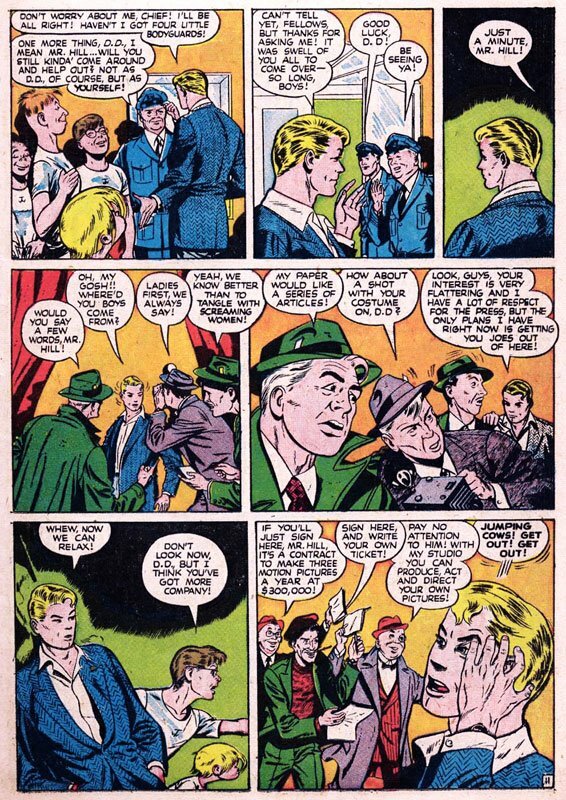 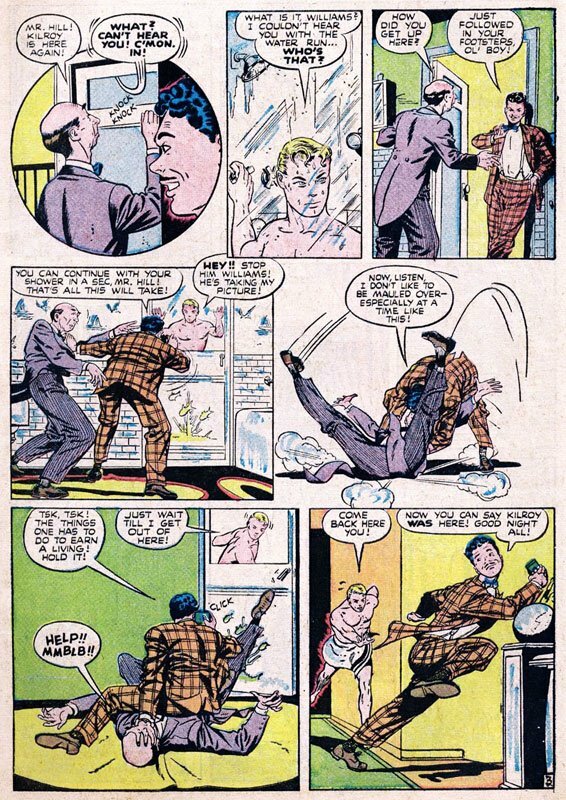 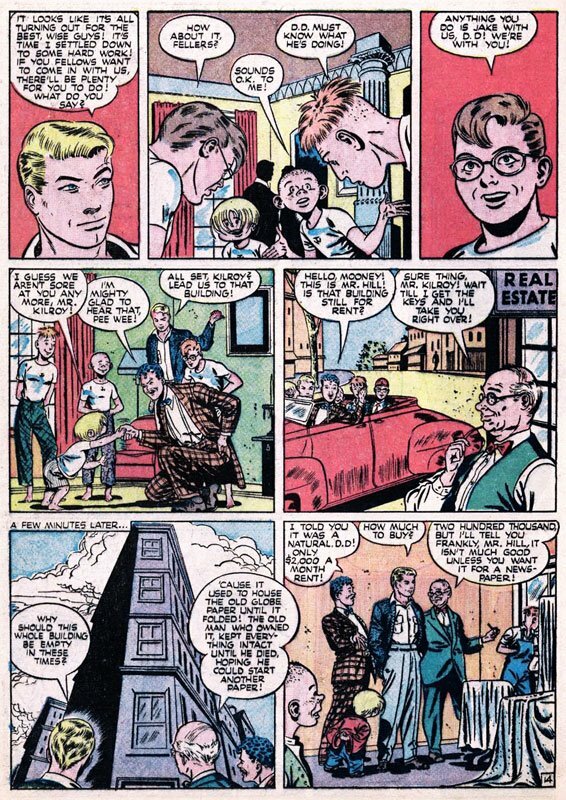 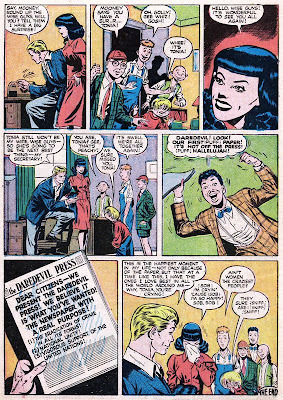 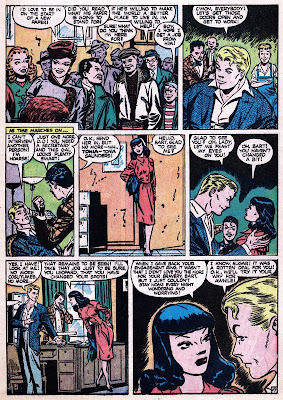 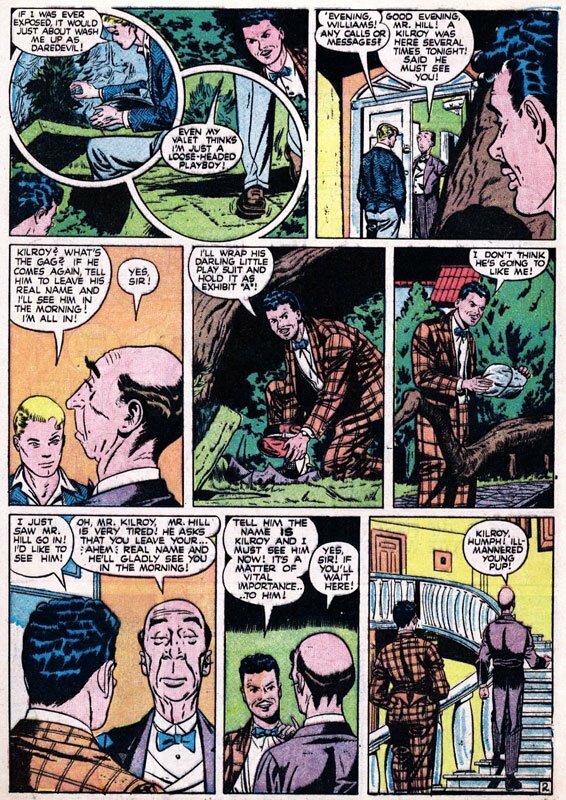 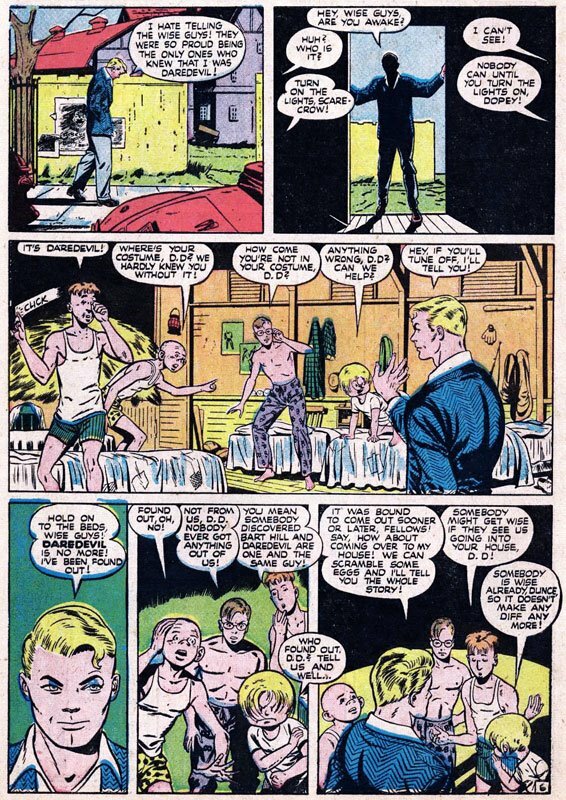 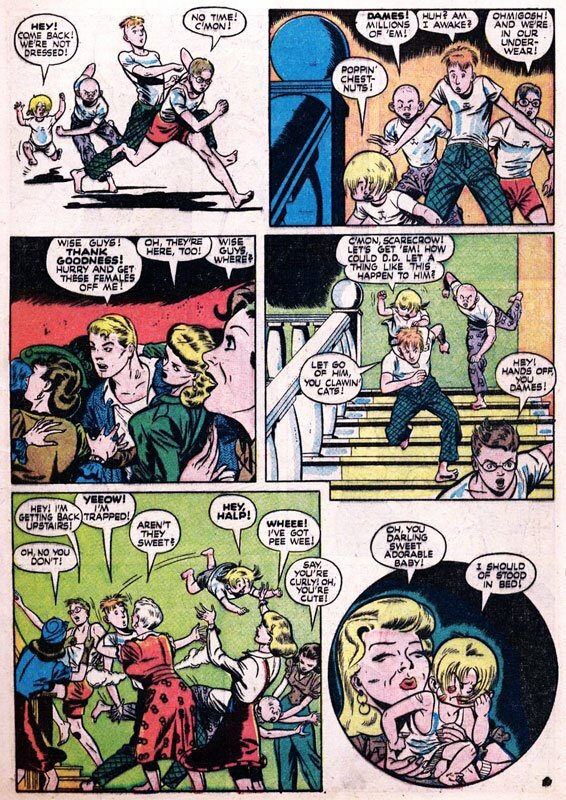 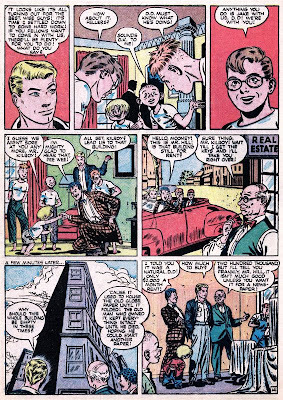 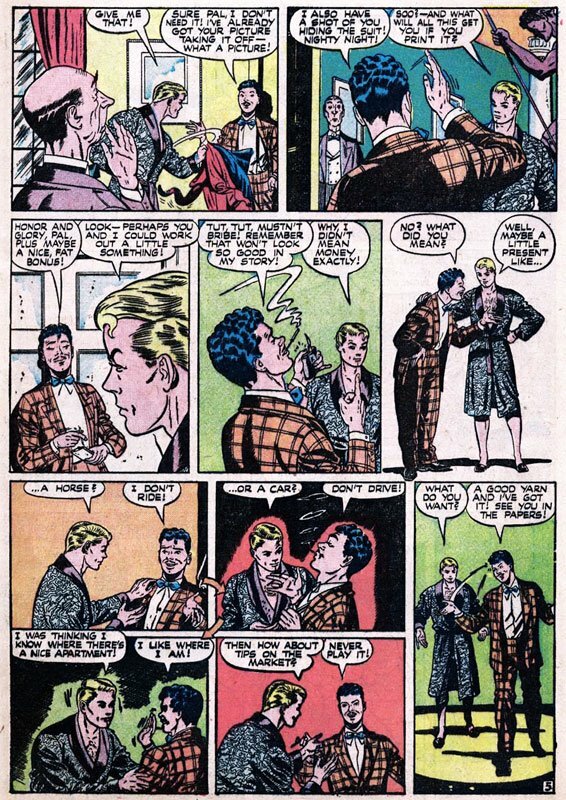 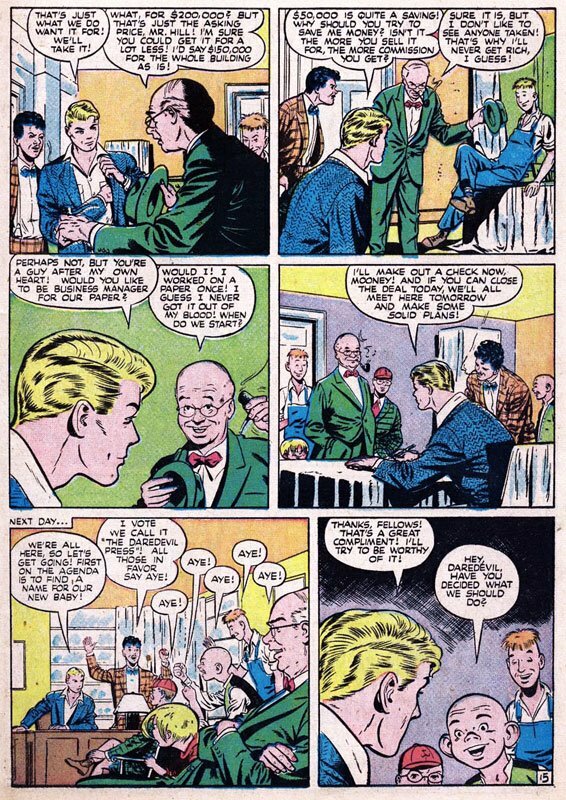 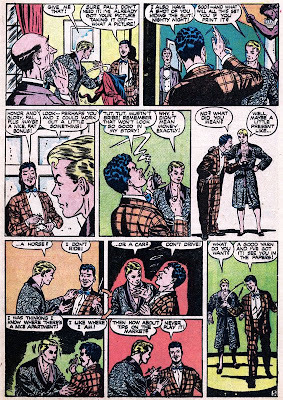 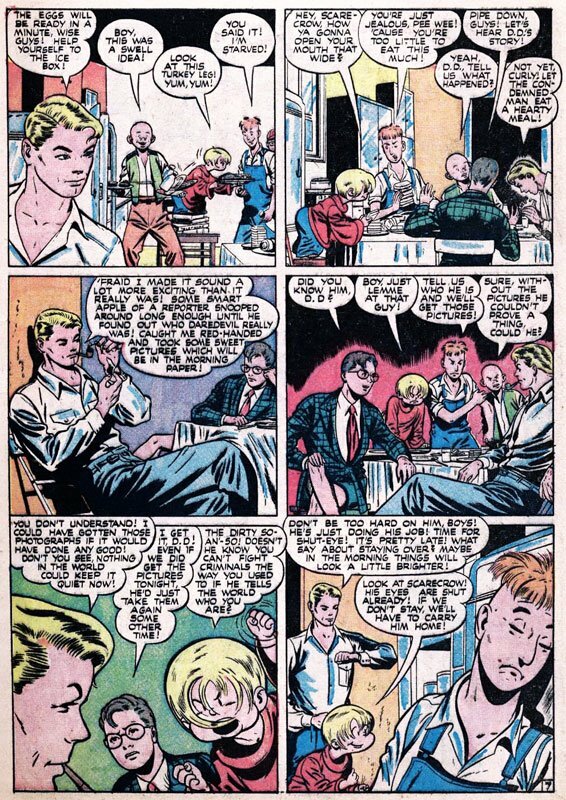 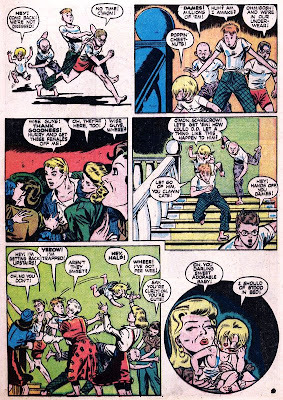 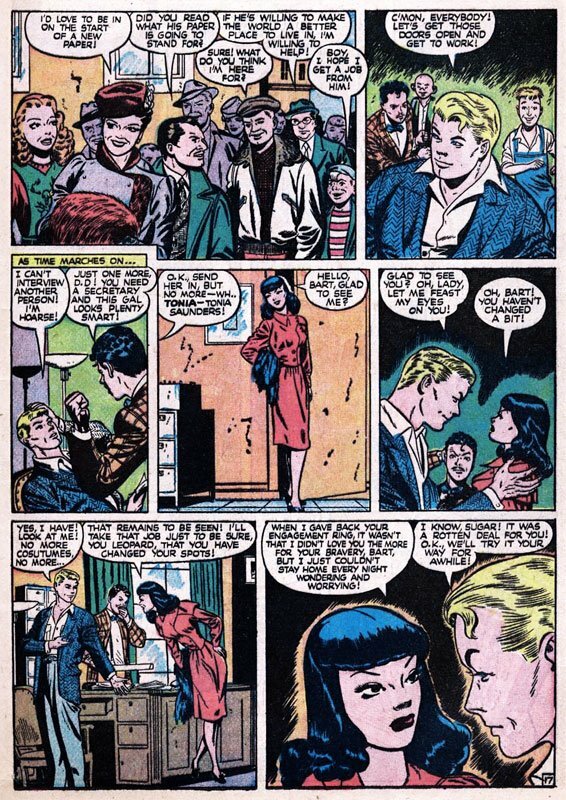 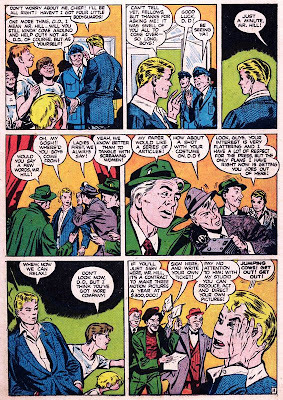 Although, I guess, by Golden-age standards (the number of one-appearance characters and all) he did okay. 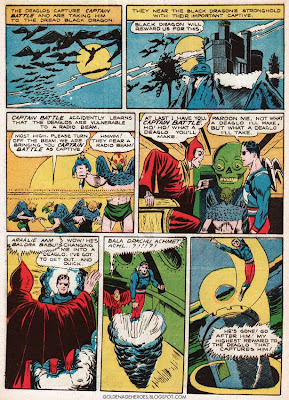 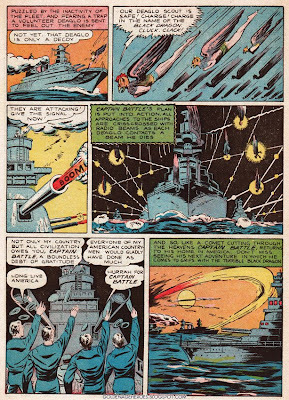 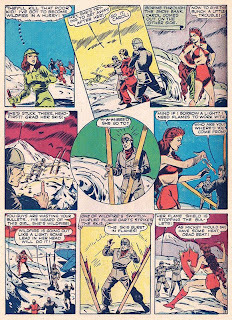 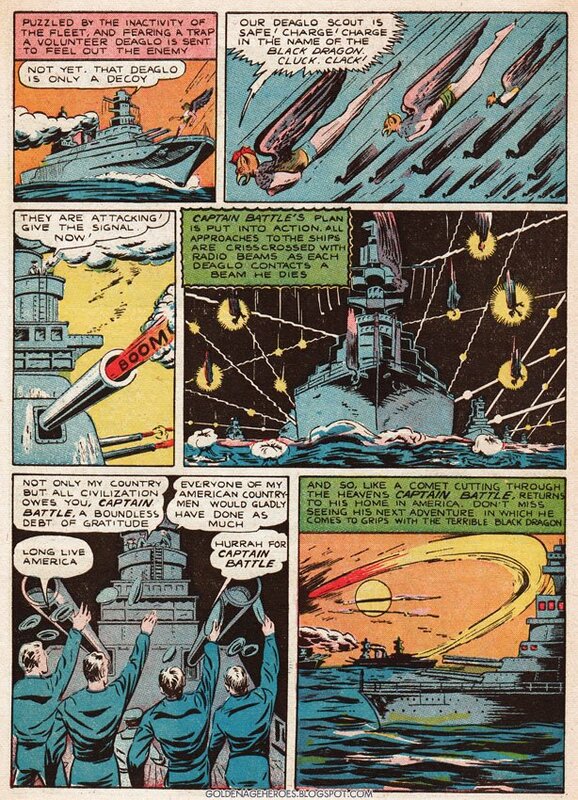 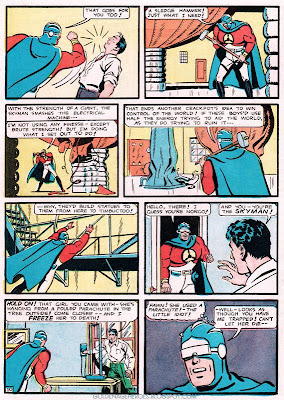 He appeared in SILVER STREAK COMICS #10-21 (May 1941-May 1942), CAPTAIN BATTLE COMICS #1-2 (Summer-Fall 1941), #3 (Winter 1942) and #5 (Summer 1943). 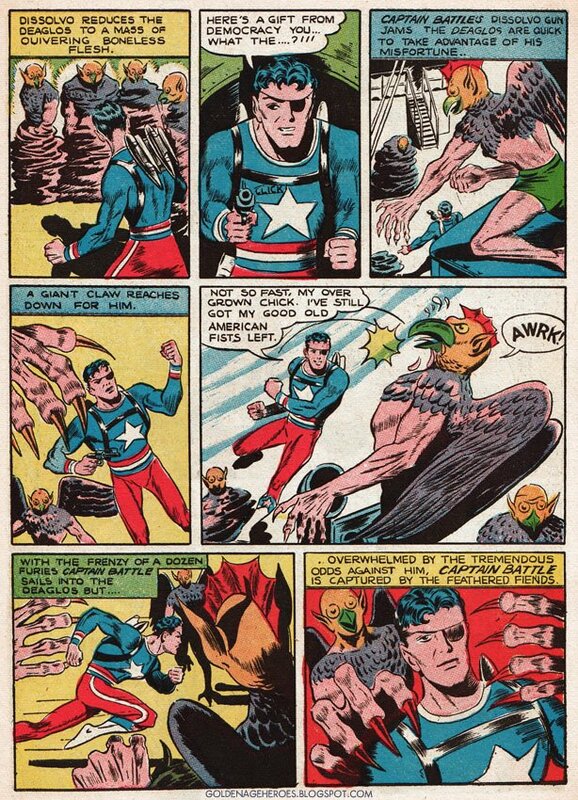 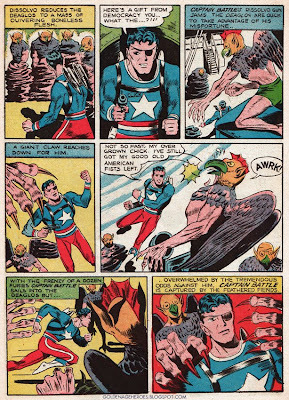 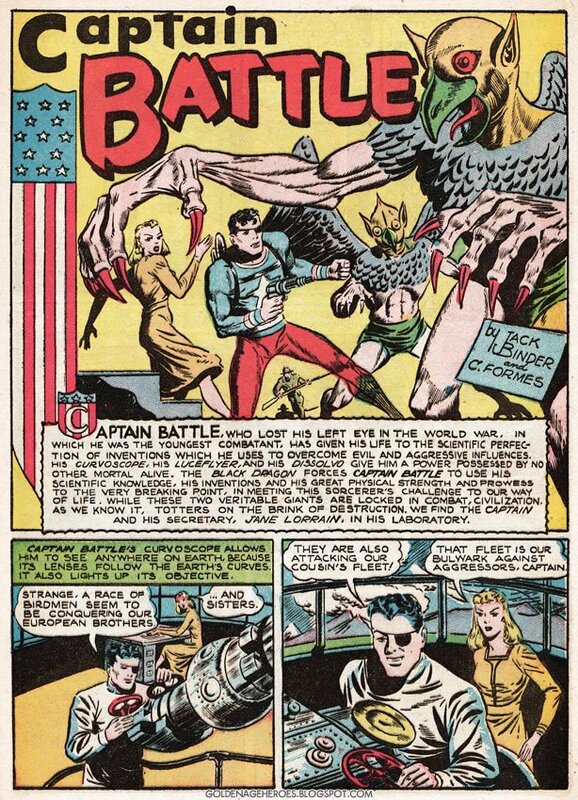 Whatever happened to CAPTAIN BATTLE COMICS #4 is a mystery, I guess. 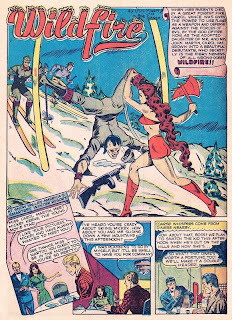 Wildfire had a short run from SMASH COMICS #25-37 (Aug 41-Nov 42). 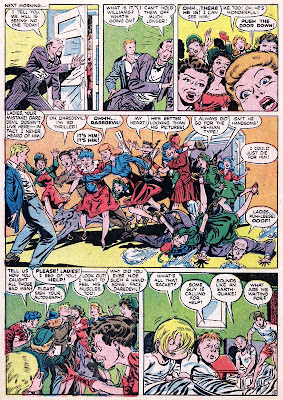 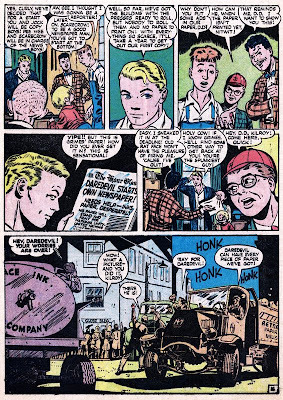 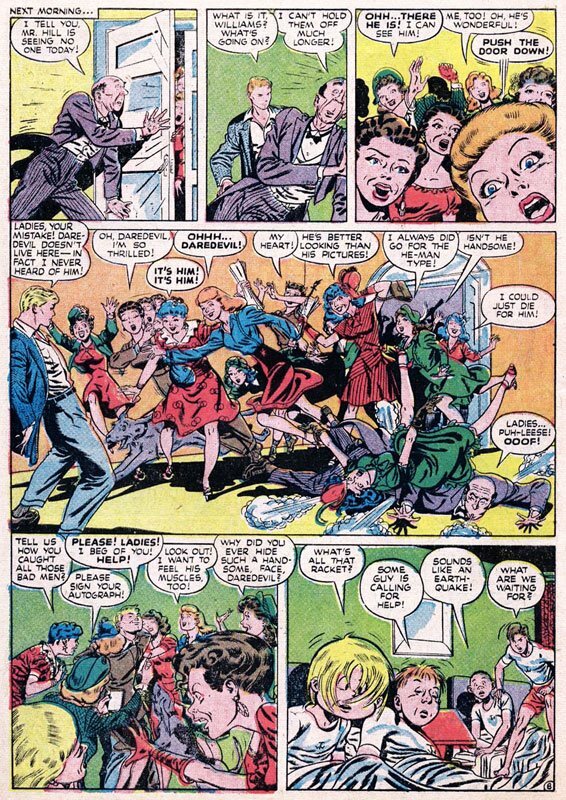 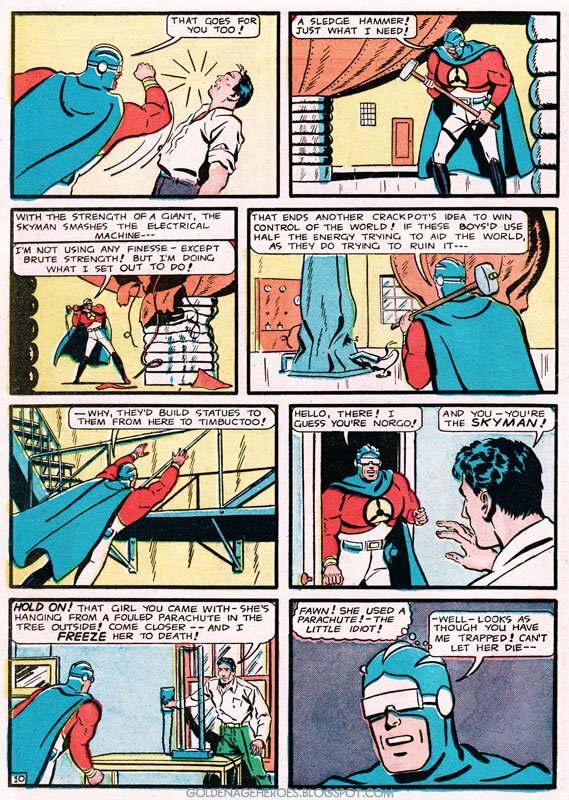 Roy Thomas wanted to use Wildfire in ALL STAR SQUADRON, as he was reviving many of the Quality heroes that were in the DC stable, but since there was already a Wildfire in the Legion of Super-Heroes, DC nixed the idea. 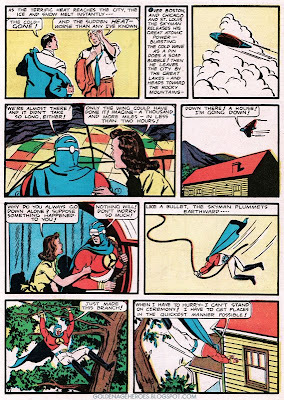 So Roy created a female version of Quality's non-powered hero, Firebrand, and gave her Wildfire's powers. 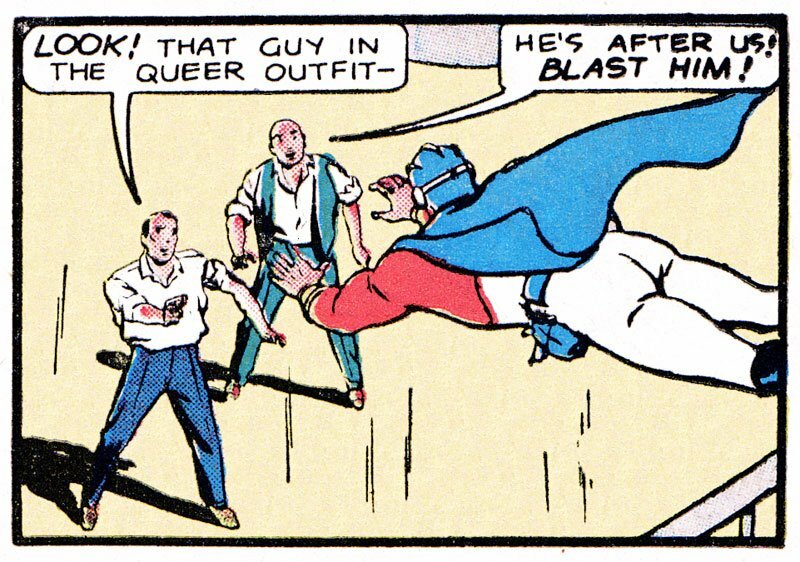 Nifty how that works! 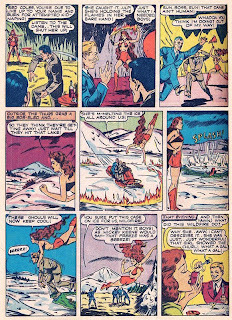 Read all about her at Toonopedia and Wikipedia. 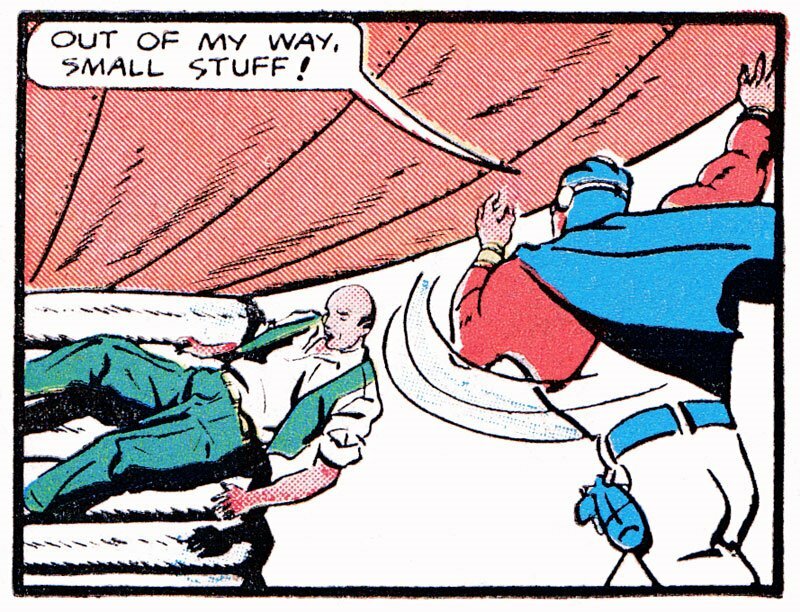 Yeah, that big splash panel on the first page...I don't know either. 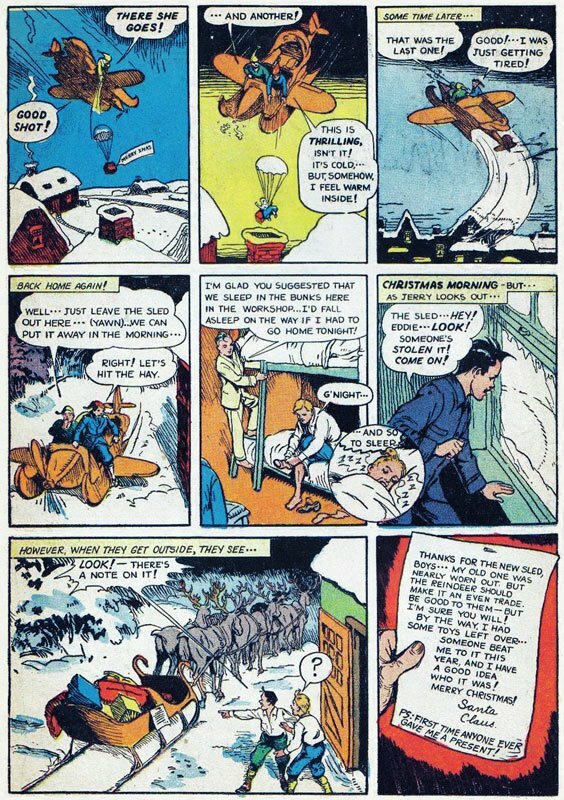 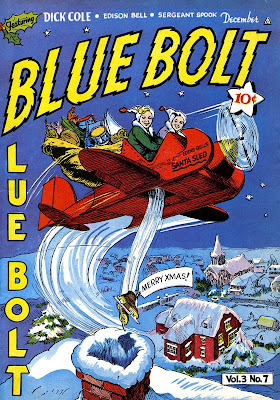 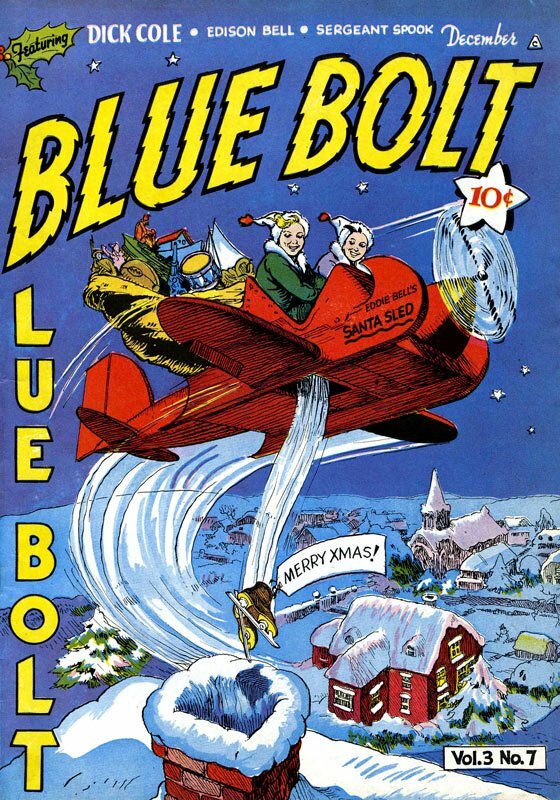 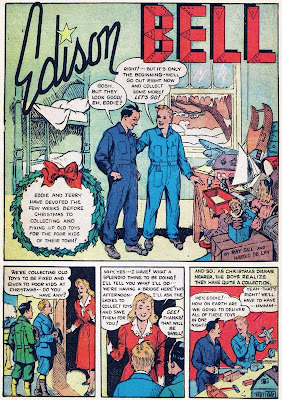 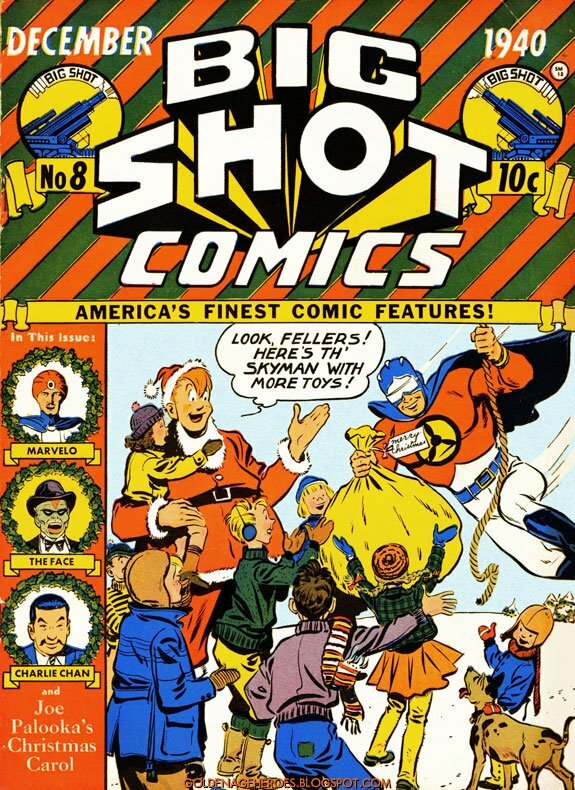 I wanted to do some Christmas-y stories, but there don't seem to be a whole lot that don't feature DC Comics characters! 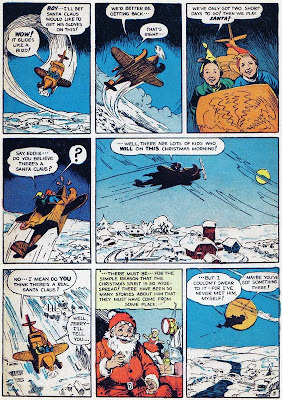 So here's a snow-y story featuring Skyman!! 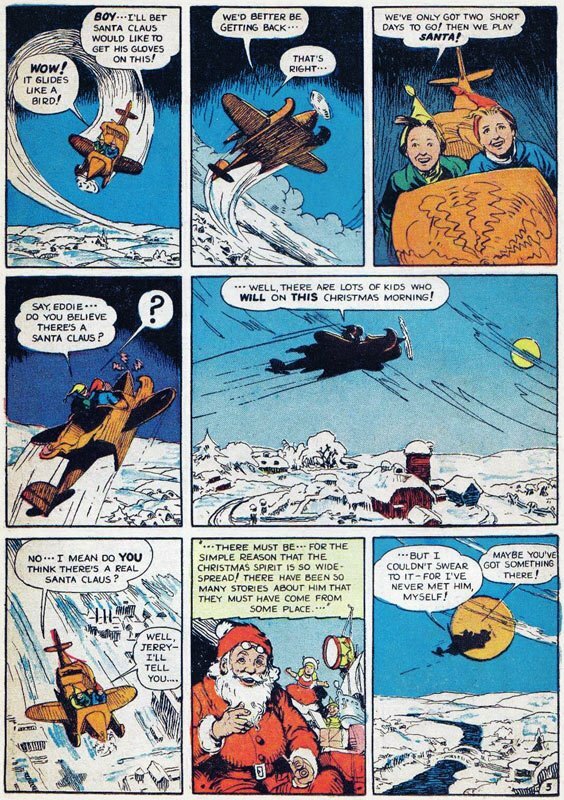 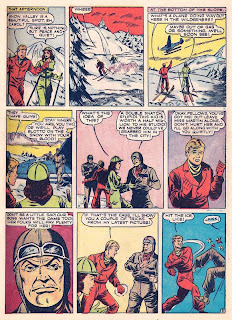 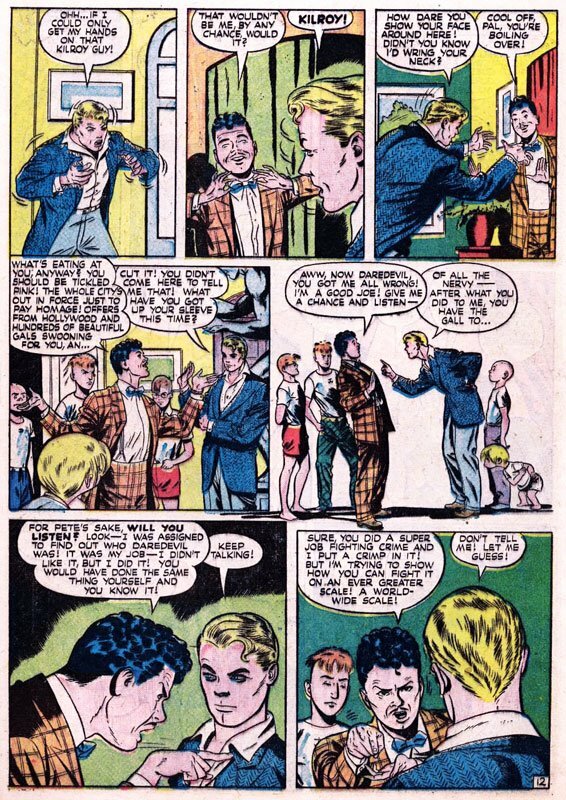 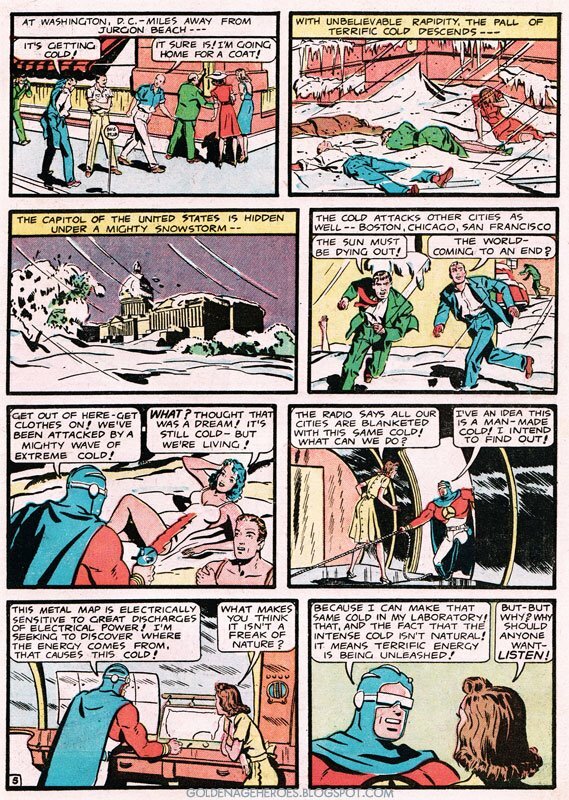 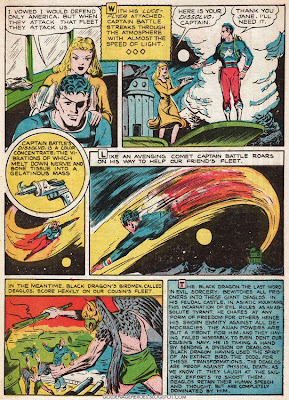 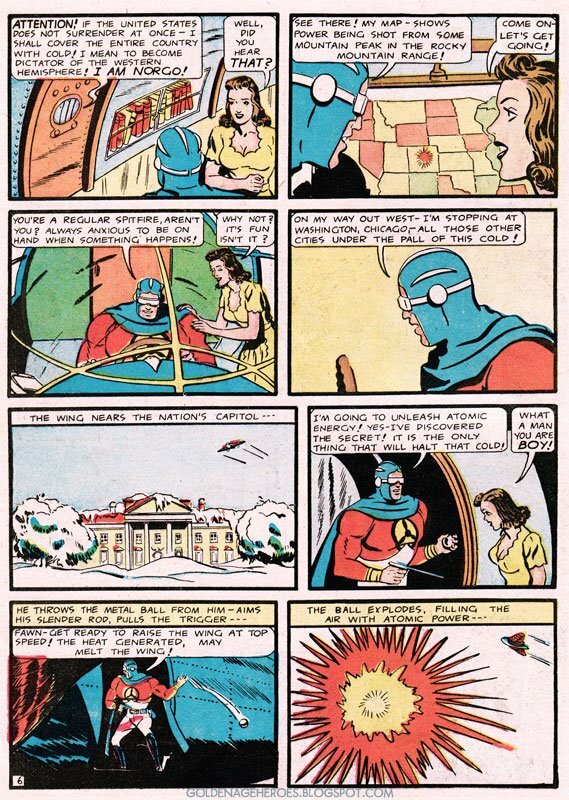 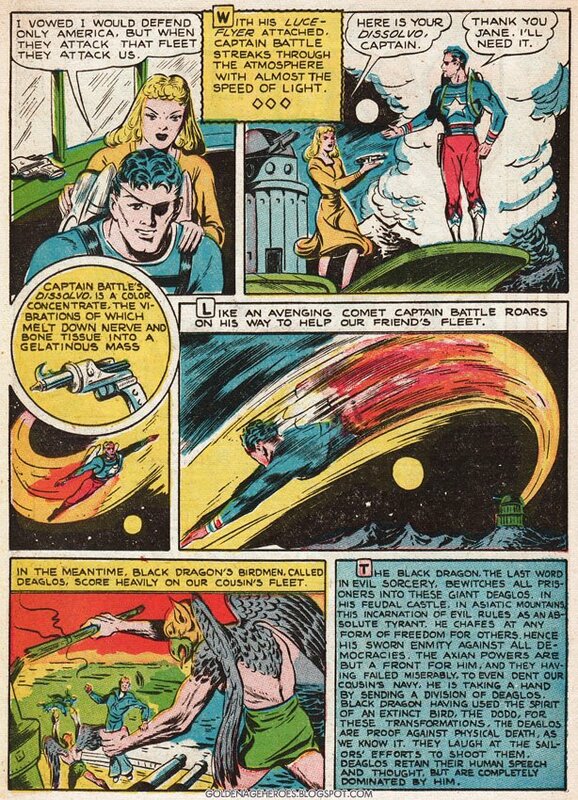 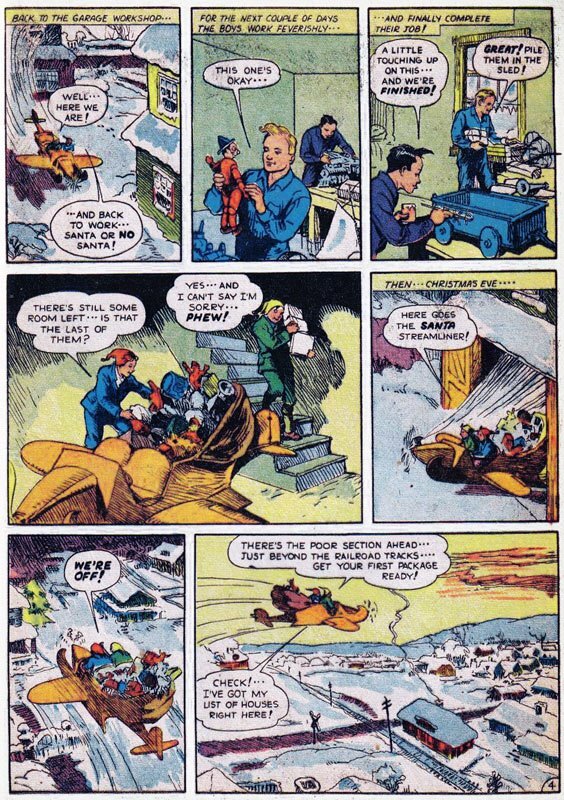 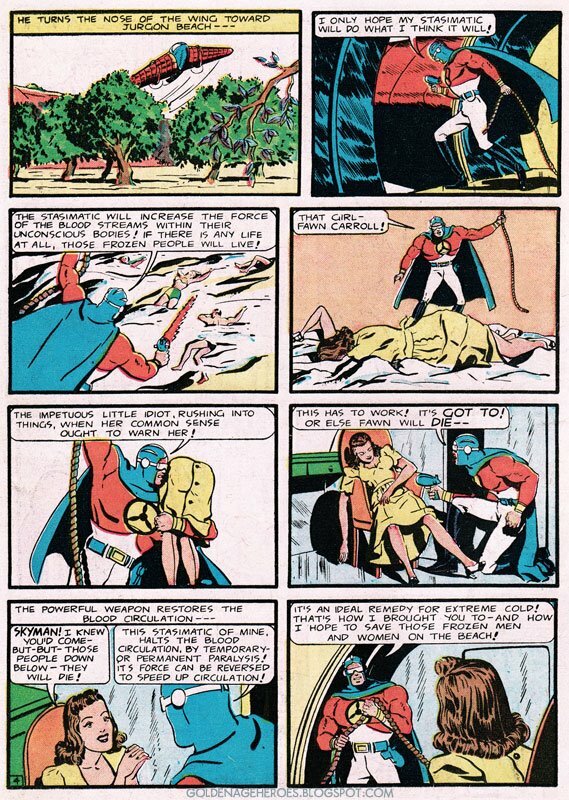 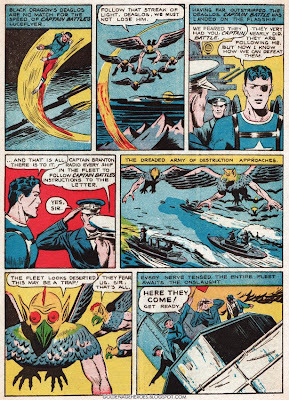 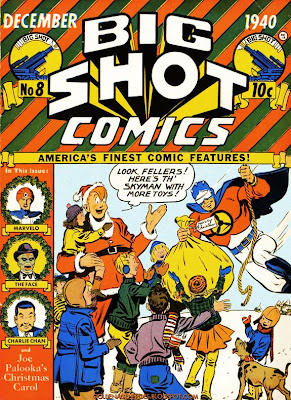 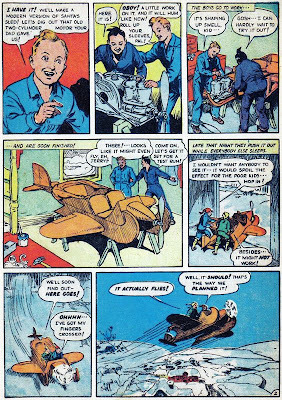 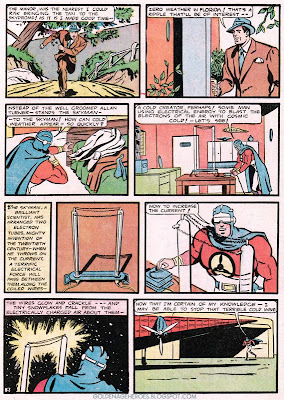 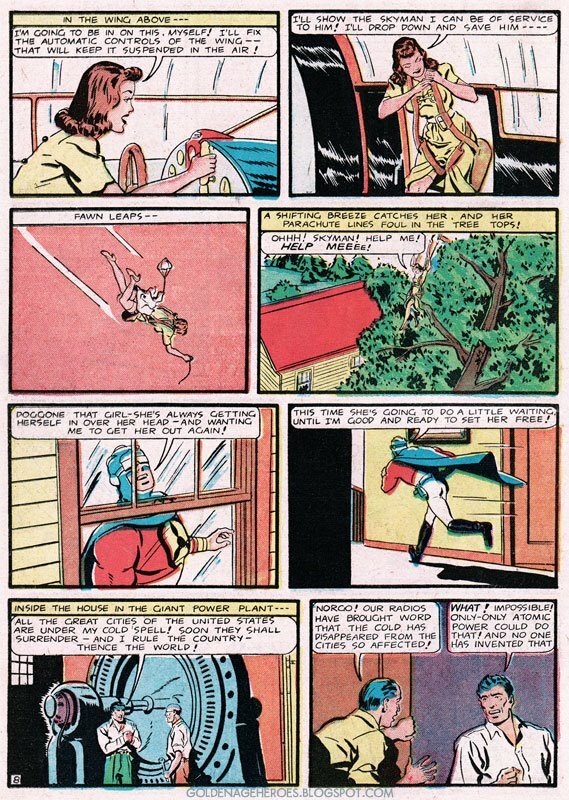 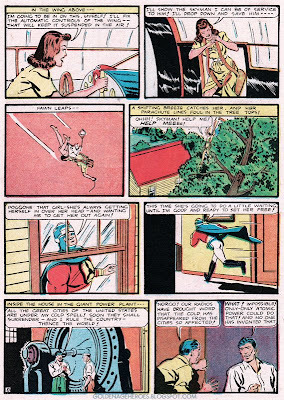 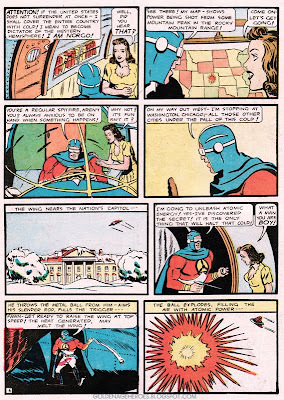 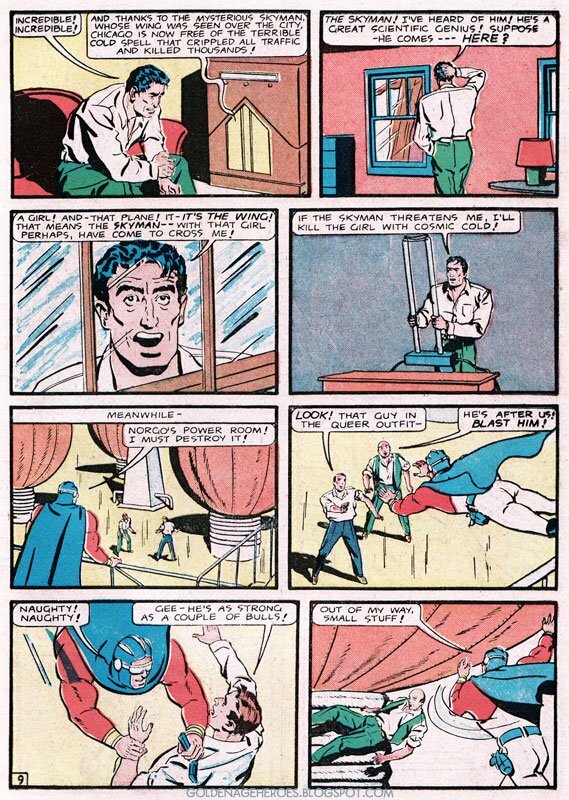 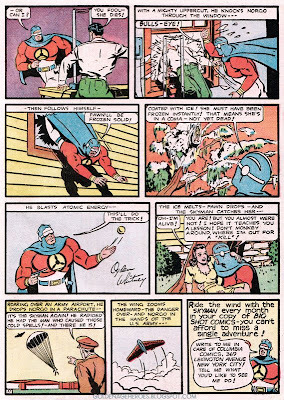 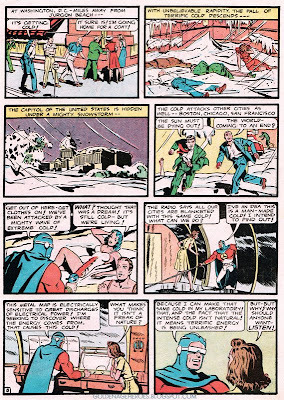 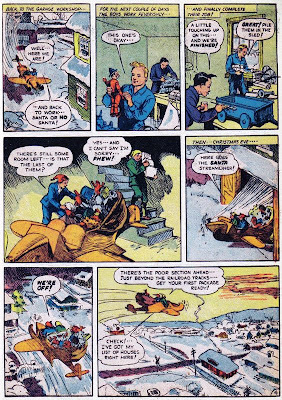 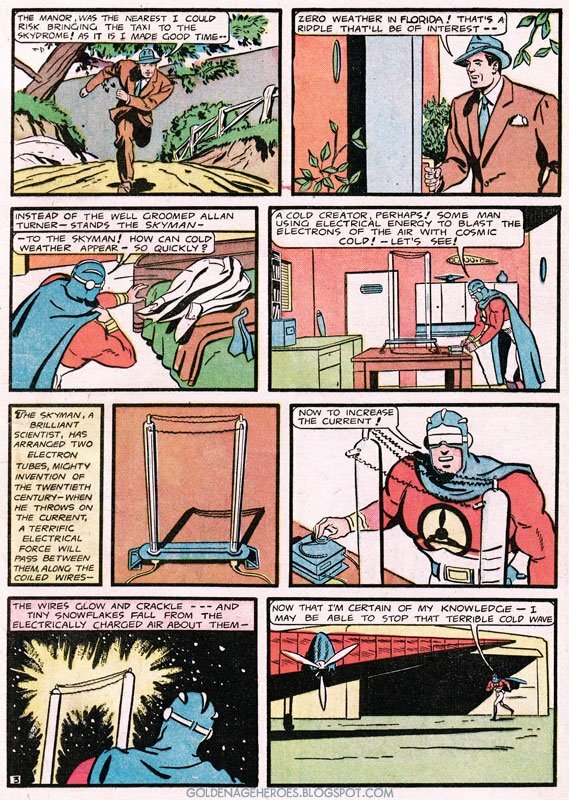 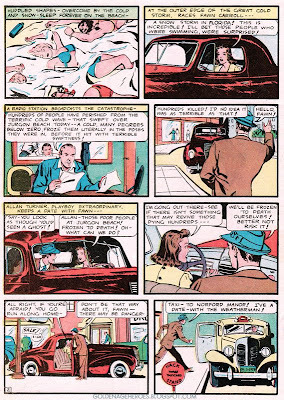 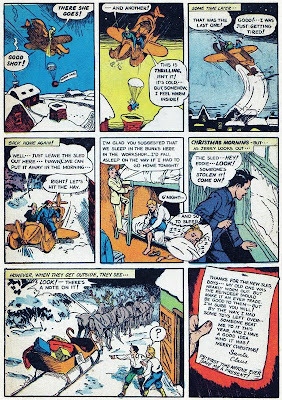 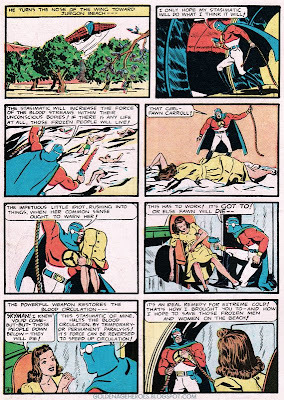 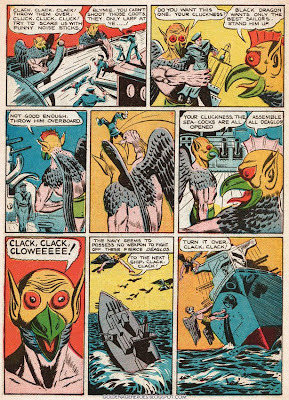 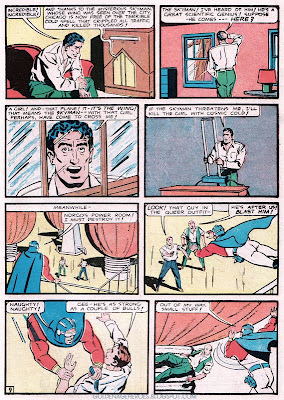 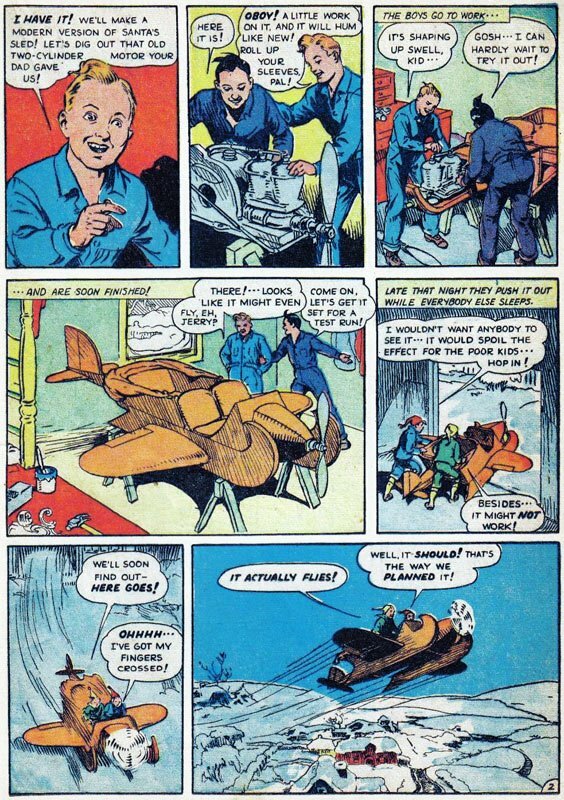 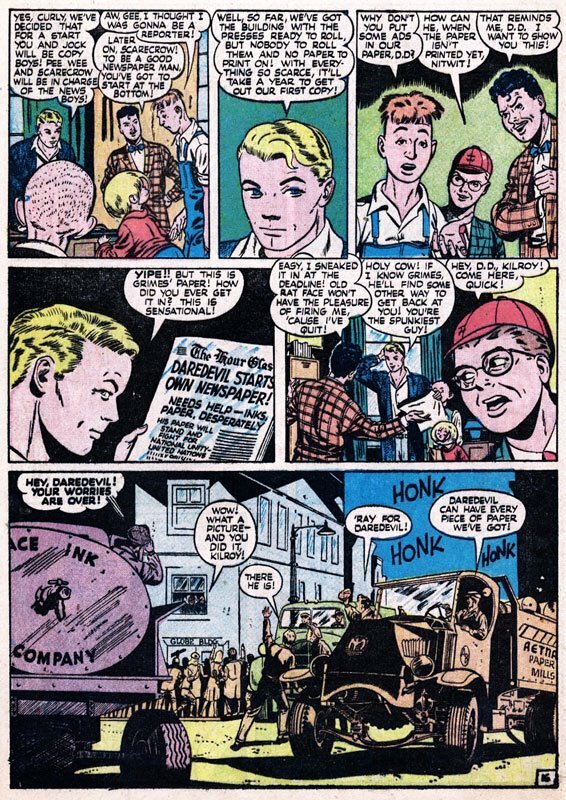 Skyman had a pretty healthy career: He appeared in BIG SHOT COMICS #1-101 (May 1940-May 1949) along with 4 issues of his own series, spread out from 1941-1948. 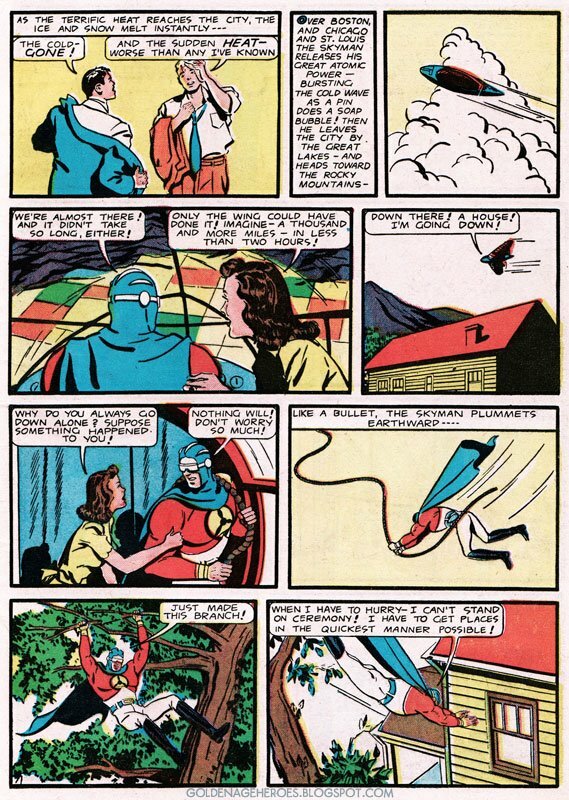 You can read more about Skyman at Wikipedia, Toonopedia and International Super Hero. His mouth is saying, "impetuous little idiot!" 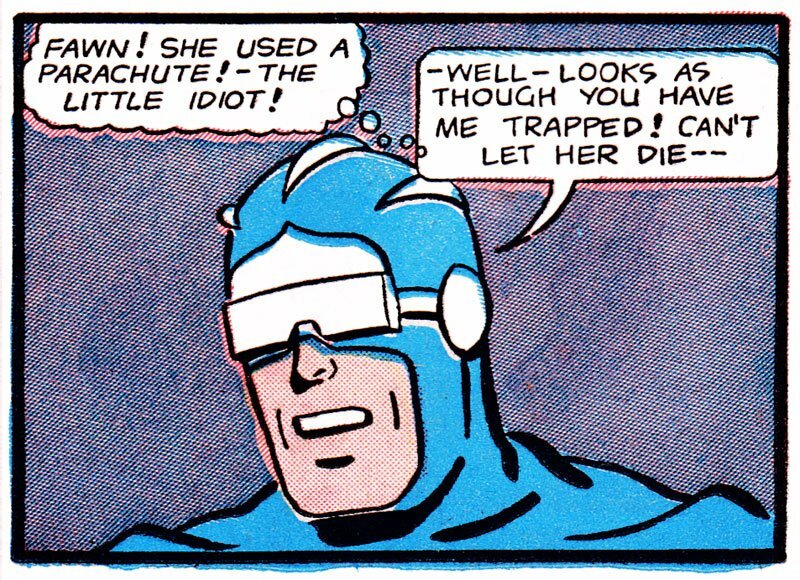 But his eyes are saying, "Mmmm, tasty!" 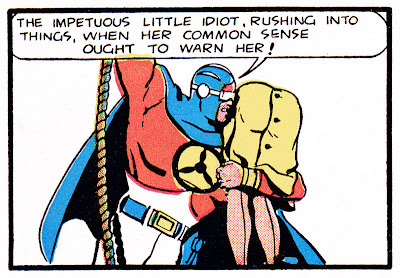 Again with the "idiot." 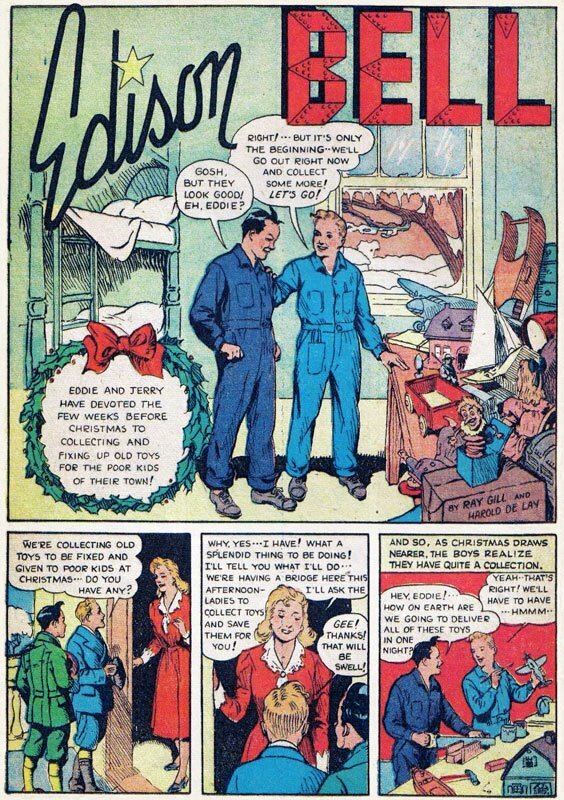 Misogynistic much? 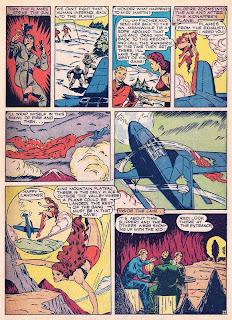 (Not to mention that he already knew she had parachuted out of the Wing. He saw her stuck in the tree and left her there!! 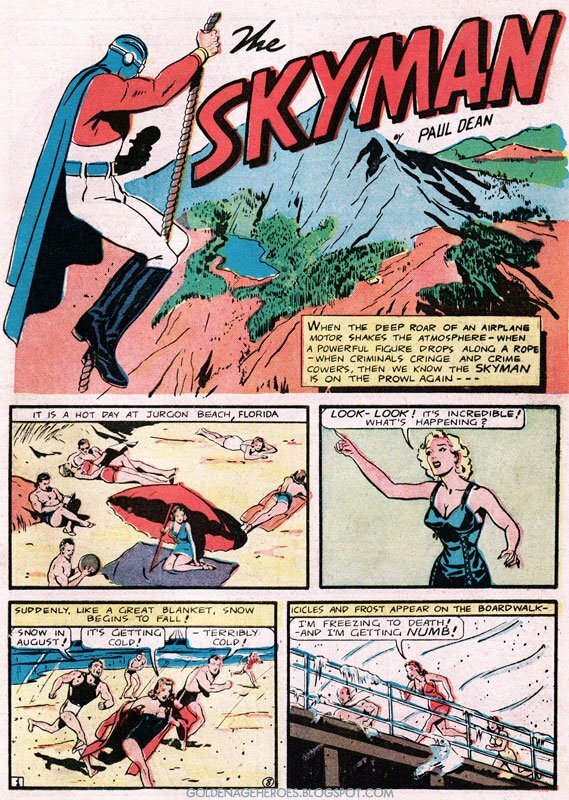 Skyman is a size queen. 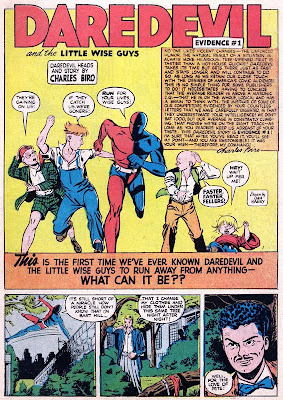 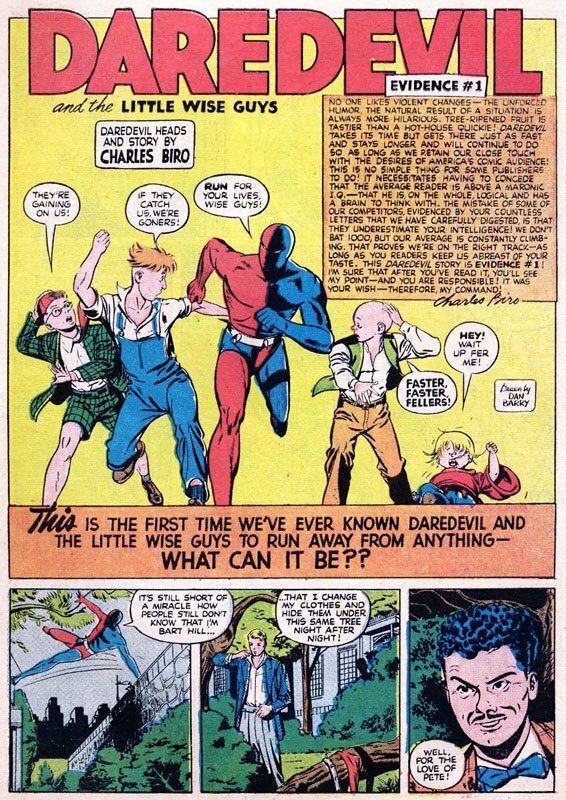 In this titanic tale, Daredevil's secret identity (and more!) 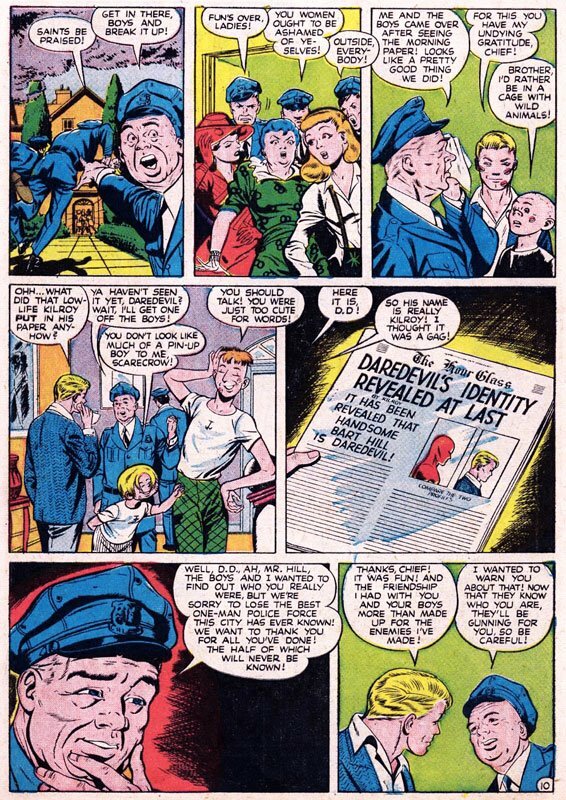 is exposed!! WONDER why Bart Hill would switch identities out in the open anyway!! THRILL at the sight of Bart running around in a skimpy little towel! 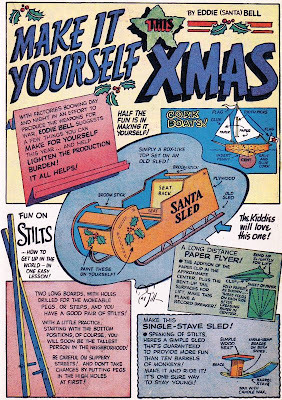 BE AMAZED by Bart's now-you-see-it-now-you-don't chest hair! 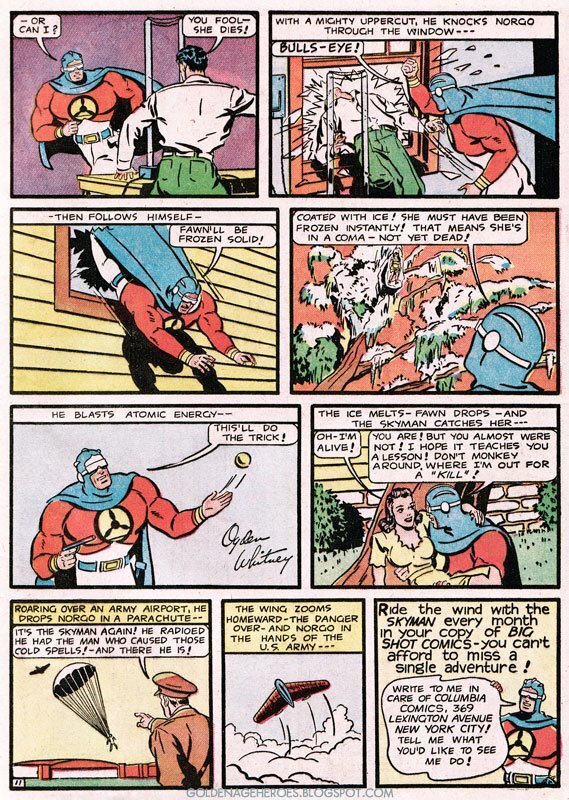 HYPOTHESIZE as to why Bart thinks the nudie pics that Kilroy snaps of him are "sweet!"